Last summer we saw a rare case of diphtheria in Spain involving an 6-year-old unvaccinated child who attended a summer camp with 57 vaccinated children. A follow up investigation found 8 of the child’s healthy camp contacts were PCR positive for the diphtheria bacteria. While vaccination is very protective against developing the disease, vaccination doesn’t preclude the asymptomatic carriage of the toxigenic C. diphtheriae bacteria. On 17 March 2016, Belgian authorities reported a fatal case of toxigenic respiratory diphtheria through the Early Warning and Response System. This rapid risk assessment describes the epidemiological situation of diphtheria surrounding this case of toxigenic respiratory diphtheria and lists public health options aimed at resolving the acute shortage of diphtheria antitoxin, improving the knowledge required to promptly recognise and treat diphtheria, and tackling the issue of non-vaccination against diphtheria in the EU/EEA. On 17 March, Belgian authorities reported a case of toxigenic respiratory diphtheria through the Early Warning and Response System (EWRS). The case had been confirmed on 15 March in Antwerp in a 3-year-old unvaccinated child of Chechnyan origin, born in Belgium. The case had onset of symptoms on 6 March. On 10 March, the child was transferred from a regional hospital to the University Hospital in Antwerp and admitted to a special intensive care unit with severe tonsillitis. Diphtheria was included in the differential diagnosis and a search for DAT was started the same day. Since no DAT was readily available in Belgium, the search was extended but not expedited as the girl’s clinical condition improved. At this point, no formal microbiological diagnosis had been made. On 11 March, the girl was transferred to the ward in an isolator. Later on, she developed an AV block and myocarditis. An external pacemaker was used. On 15 March, the National Reference Centre for diphtheria in Belgium confirmed the case as caused by toxigenic Corynebacterium diphtheriae, which was later confirmed by the WHO Global Collaborating Centre for Reference and Research on Diphtheria in the UK. 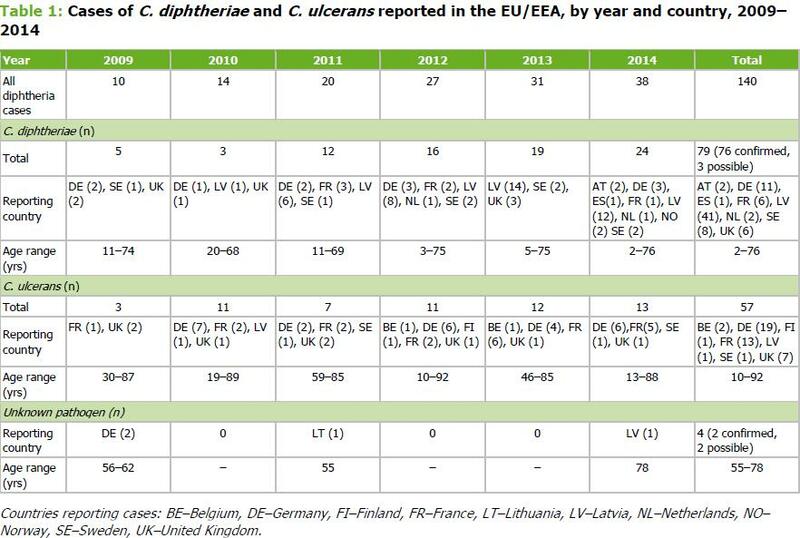 As there is no stockpile of DAT in Belgium, ECDC helped to procure the antitoxin when contacted on 16 March 2016. The National Institute for Public Health and the Environment (RIVM) of the Netherlands supplied the antitoxin the same day. Despite administration of DAT, the child died on 17 March. Upon confirmation of the case, Belgian regional authorities implemented prevention and control measures according to regional regulations . Control measures: The family of the child received prophylactic antibiotic treatment and were swabbed to determine the presence of the bacterium. The medical personnel and caregivers – who could have been exposed to droplets during the admission process in the first hospital – were swabbed and received antibiotics. The doctor at the day-care centre verified the vaccination status of all children in the child’s group and another two groups in adjacent rooms. 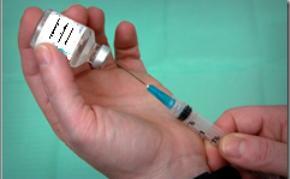 One child needed a supplementary vaccination. All others were vaccinated in accordance with the vaccination schedule. On 16 March, all parents who had children in the day-care centre received a detailed information letter. Staff and parents of pupils in the day-care centre attended by the child were informed individually, and supplementary vaccination was provided on an individual basis as appropriate. Only one child needed a supplementary vaccination. The parents and three siblings of the case tested negative for C. diphtheriae. Preliminary results of the screening of the healthcare personnel (N=15) and of the children at the day-care centre (N=26) indicated that they were all negative for diphtheria. In Flanders, vaccinations against diphtheria are offered at 8, 12 and 16 weeks of age, with booster doses at 15 months, 6 years and 14 years of age. A survey in Flanders in 2012 estimated vaccination coverage for diphtheria at 98.7% for the third dose and 93.0% for the fourth dose . For Belgium, vaccination coverage for diphtheria was estimated at 98.8% for the third dose and 92.7% for the fourth dose of DTP by weighted average of regional vaccination coverage surveys from 2012 to 2015. 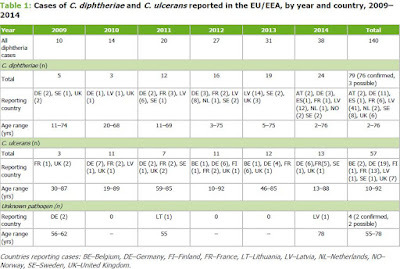 Although largely eliminated due to vaccination, the EU still reports a handful of cases each year. The following chart from the ECDC RRA shows a steady increase in C. diphtheria cases over the past 6 years (5 in 2009, 24 in 2015).